Arthur Squibb began his career as a Proprietor of Stationery in England during the late 1800’s after learning the trade at his family’s store. After working in a prestigious stationers in London, he set out on his own in St Leonard’s-by-the-Sea, England. He married his wife Cary in 1900. After losing their first born child, they decided to leave their heartbreak and a few years later, they emigrated to Canada settling in Toronto. By then, they also had a new son named Gordon. Looking for a business they could run similar to that which they left in England, they found the perfect ‘situation’ in the town of Weston called Richardson’s at 54 Main Street. Upon purchasing the store on May 5th, 1927, they set about making it their own and renamed it A.T. Squibb Stationery and Books. They settled into their life in Weston and with their son Gordon ran the business together. In December of 1935, they had the opportunity to move the store a few doors south into the southern half of a large house that had belonged to Dr. Irwin but had been converted to a commercial property in 1925. There was also a nice sized apartment above and they moved in as well. So just before Christmas of that year, they moved to their new ‘commodious’ location at 48 Main Street which later become 1974 Weston Road. By this time, they were the purveyors of a great variety of products including textbooks, office and school supplies, magazines, tobacco, candies and even ice cream. If you needed something, you came to Squibb’s! The 1930’s were lean times but the 1940’s brought better fortunes and the store thrived. Gordon was now married and with his new wife Iris, lived above the store for a short while. They moved a short distance away, to Thistletown, once they started their own family in the early 1950’s. By 1954, Arthur had passed away and Gordon had now taken over the business with his mother. They carried on, continuing to build the business and with the good times of the ‘50’s and ‘60’s the store’s reputation grew. In 1972, all that changed with Gordon’s illness and he was forced to sell the business. A Mr. Wood bought the store and kept the name but decided to make some changes to the front of the store. He only had the business a short 3 years before he also decided to sell and he in turn sold it to the Janetakes family who bought it for their son, Mike, a graphic artist, to run. Unfortunately, it wasn’t for him either and they in turn sold it to Jack and Marilyn Weinberg on April 10, 1980. A new era for Squibb’s was born. Jack and Marilyn had recently sold their store at Yonge and Lawrence but were looking for a new situation for themselves. An ad in the paper brought them in to look at this different type of business (they had owned a traditional variety and cigar shop) but they immediately felt at home in the stationery business having had experience with school and art supplies. As they became familiar with the business and the community, they grew to love their new store and the people who came in to greet them. The 1980’s were very good to them and the store. The early 1990’s were difficult for business but Jack and Marilyn carried on making sure that the store continued on. But in 1995, Marilyn became gravely ill and soon passed away leaving Jack to run the store. Their daughter, Suri, decided that she would come to help her dad run the store having had a great deal of experience in other retail settings as well as having worked at Squibb’s throughout the years. As the years went by, Jack also began to slow down and generally left the day to day running of he store to Suri until he too became ill in 2000 and then passing away in early 2001. In the years since Marilyn’s & Jack’s passing, Suri has run Squibb’s with the help of her husband Mike, carrying on the great tradition started by Arthur and Cary Squibb in 1927, then Gordon and his mom in 1954 and finally, her own parents from 1980. Suri and Mike strive to maintain being a small Canadian independently-owned business, servicing their clients across the GTA with the personal touch. Their main business is the educational market and are proud to be able to say they are the oldest, independent textbook seller in Toronto. The store is still chock-a-block with stationery products (some dating back to the 1960’s!) along with art supplies, school supplies, gifts, cards, Bibles, children’s books, etc. They still keep in touch with the children of Gordon and Iris Squibb and were thrilled that two of them and their families were able to celebrate the 80th Anniversary of the store in 2007 with them. 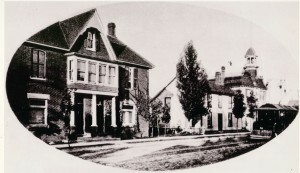 Home and offices of Dr. Irwin at 48 Main Street, circa 1900. 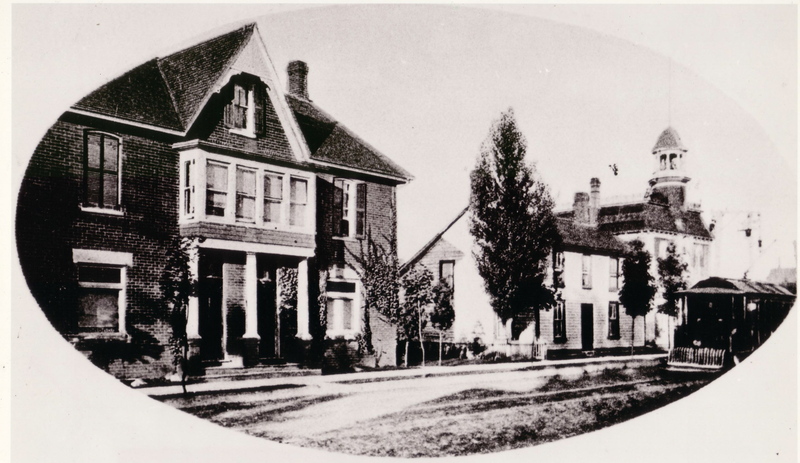 The home was split in two in 1925/26 and turned into 2 commercial properties. The original Squibb’s store was in the white building just north at 54 Main Street from 1927 to 1935 which had also been converted to a commercial property. Squibb’s moved south to its current location in December of 1935. As a relatively new resident in the Weston Village, I was fascinated to read the history of Squibbs. What a great thing it is to know that my neighbourhood stationary supply store has been suce a cornerstone to the local business here in Weston. Shop local. Support your neighbourhood, and help build community where you can! !